Tibetan hammered singing bowls are used to create healing energy which can unblock the chakras, and they are excellent meditation gongs. 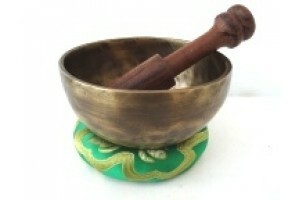 We are a major stockist of singing bowls, hand-selected by us for sound quality. 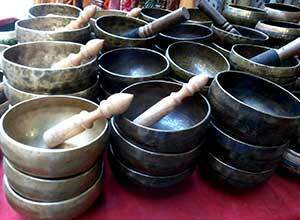 We keep a large number of singing bowls in stock, although we can only show a few examples here. Viewing at our premises is welcome by appointment. We also sell a number of bowls by playing them over the phone or by Skype demonstration. A small hammered Singing Bowl with a blue br..
11 cm diameter x 5.5 cm deep Hammered Singing Bowl..
11.5 cm diameter hammered singing bowl with a..
An 13 cm diameter x 6 cm deep Meditation Singing B..
14.5 cm diameter x 8 cm deep Hammered five metal b..
15 cm diameter Hammered Five -Metal Singing Bowl e..
15 cm diameter Hammered Singing Bowl with a blue b..
15 cm diameter x 7.5cm deep Hammered Singing Bowl ..
15.5 cm diameter x 8.5 cm deep Hammered five-metal..
15.5 cm diameter Hammered Singing Bowl with brocad..
15.5 cm diameter Hammered Singing Bowl with a blue..
17 cm diameter x 9 cm deep Hammered Five Metal Sin..
22 cm diameter rare Old seven-metal bronze hammere..
23 cm diameter five-metal bronze hammered singing ..